It’s The Most Wonderful Time of the Year. We’re not talking about the Holidays – we’re talking about Best of Sea! Best of Sea is back, and who better to give you a taste of the Ocean than our restaurant’s right here in Cavendish Beach? 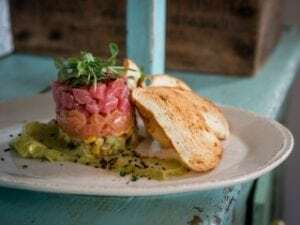 So get ready – your mouth is about to water and your stomach is about to growl because we’re giving you a glimpse of what is the Best of Sea in Cavendish Beach. This incredible APP is jam packed with flavours – including the taste of Atlantic Salmon and Bluefin Tuna. Chef Jamie Power fills both of his two courses with incredible flavour and over four types of Sea Creatures in his dishes. 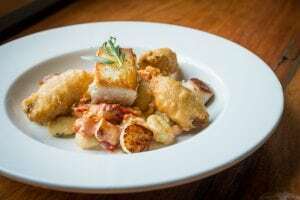 Chef Duncan Smith pulls NO punches with his Seared Halibut and Scallops, perfectly paired with creamed lobster, Island Gouda Gnocchi and PEI Oyster Fritter. Not only is Chef Power’s menu making us hungry, but we can’t wait for that fantastic ambiance that Broadway 45 always does so well. It’s not a trip to Cavendish Beach for Seafood without stopping at Carr’s Oyster Bar! 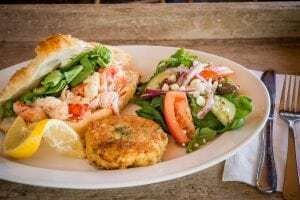 When you think of the true PEI Seafood experience – you think of a lobster roll’s and Crab Cakes, right? Carr’s Oyster Bar is taking it one step further – creating a Lobster AND Crab dish. They are offering a PEI Lobster topped croissant topped with home-made mayo, a PEI Rock Crab Cake and Chipotle Mayo. 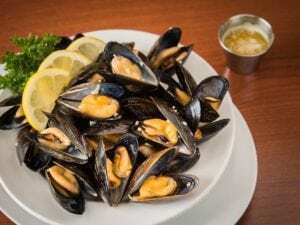 We want you to show us your “mussels”, so does Chez Yvonne’s! They are starting your meal off with a beautiful dish of Fresh PEI Mussels. These beauties are steamed in white wine, minced garlic, and served with Garlic Butter. Are you ready for a “halibut” time? 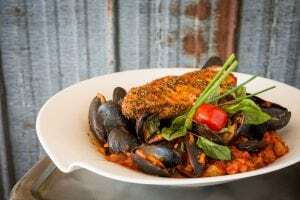 At Sou’West Bar and Grill, Halibut Jambalaya is on the menu for their main show-stopper. Get your taste buds ready for Arborio Rice Infused with Creole Seasoning, White Wine, House Made Marinara, Local Chorizo and PEI mussels. As if that isn’t enough, it is all topped off with Creole PEI Halibut. Hungry yet? Which Cavendish Beach Restaurant will you stop by first? You have an entire month to figure it out, so get the car ready and make a trip to Cavendish Beach for what we guarantee is a true Best of Sea experience. Not sure what you want? We have SO many great options for eating in Cavendish Beach. Check out the full list here.